ashramblings: ¿Tejar o tejer? To tile or to knit? One of this first ever stories, it can be found in his collections Bestiario (The Beastery) and Casa tomada y otros cuentos. Still consulting a dictionary, I read this as part of my Spanish Challenge. In the story, an unnamed man and his sister, Irene, stay on in a huge old house that had belonged to their parents and their grandparents before them. Bother are middle aged and unmarried. Irene knits, but unravels much of her work. He reads and smokes a pipe. They have no contact with other people outside of the house. One evening upon going to the kitchen for a glass of water he hears sounds coming from the library or the dining room. “Han tomado la parte del fundo” / They’ve taken over the back part” he reports back to his sister. After this, they live in the other wing of the house separated from this part by a large oak door. They have to leave many things behind them on the other side of the door. The scene repeats itself, with the man going to the kitchen for a drink, hearing the noise from the kitchen or the bathroom, until the two become convinced the noises have moved onto their side of the oak door into their wing of the house. “Han tomado este parte / They taken over our section” Irene said. There and then at 11PM they decide to leave the house leaving behind them everything, their clothes, his books, her knitting and 15,000 pesos hidden in the wardrobe. On exiting the house, he locks the door and flings the key down the drain because “It would not do for some poor devil to decide to rob the house now it has been taken over”. A strange short story. When reading it I assumed it was either a ghost story or a nightmare due to the recurrent nature of both the knitting of the sister and of him hearing the noises. 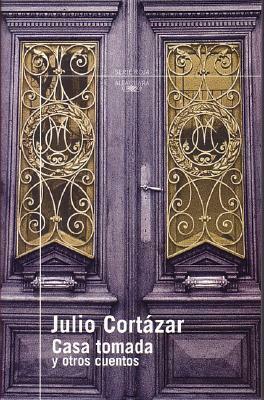 In fact Cortázar himself said in an interview that it was written from a nightmare of his own – “One of my first and most popular stories, “House Taken Over,” is a nightmare I had. I got up immediately and wrote it.” Whoever/whatever has taken over the house is never identified, because neither the brother or the sister make any attempt to investigate the causes of the noise. They have been trapped in the house by their past, their mundane life existing on a day to day basis without change or excitement, without contact with others. Then they are trapped in ever reducing set of rooms by their fear of the unknown. Only at the end do they appear to break free and venture forth into the world beyond their house. Perhaps a story of grief and grieving.